Don't you just love touch screens? I am sure we all do, however there are times when it could be quicker and easier to use an old fashioned keyboard, especially for use with a tablet like the Nexus 7 that I recently acquired. Â I went hunting throughÂ Nexus 7 accessoriesÂ at various locations to find something that might be suitable when I came across this Bluetooth Keyboard. Finding a good Bluetooth Keyboard is a lot harder than it sounds, you need to consider various things, size, quality,Â key functionality, Â battery life and price. Â For a good Bluetooth Keyboard your looking upwards of Â£30 at least rooting thoughÂ mobile phone accessoriesÂ quickly shows you that there are many different types. I will now take each one individually and compare to this particular keyboard I have. Somewhere along the line someone thought it was a good idea to make bluetooth keyboards smaller than a phone. Personally I think these are useless, keys become very hard to press which defeats the entire purpose of wanting to use a hardware keyboard in the first place. This Expression keyboard is larger than most bluetooth keyboards but still smaller than your normal size keyboards making it both practical and portable. Â It measures in atÂ 220 x 120 x 5mm and weighs just 205g and comes with its ownÂ neoprene case to keep it safe and dustfree when not in use. Like with size, different bluetooth keyboards come with different materials, some are thin and rubbery designed to withstand any abuse it might get, others a small and thick designed to feel like a second phone in your pocket, and others are more like mini-conventional keyboards (or more precise, a laptop keyboard). Â The Expression keyboard is the latter. It is built like a mini laptop keyboard, keys press as you would expect and be used to, which makes typing on it solely a matter of adjusting to its slightly smaller size. Â It is sturdy enough to place on a desk, your lap or anywhere else you might like to type. The coating around the edges is nice and soft to touch and gives it a real nice finish. Having used this for a few weeks now I can safely say I would not expect it to break easily. This is an important point to consider. Â Almost all keyboards will come with some form of functions keys, keys that do things specific to an OS e.g. the windows key on a normal PC keyboard. Â Tablet keyboards are no different, they come with a wealth of keys designed to make your tablet use easier, however, most of these are designed with iPad's in mind which means that they might not all work as expected when connected to an Android tablet. Lock, Search, Brightness Down, Brightness Up, Cut, Copy, Paste, Refresh, rewind, play/pause, fast forward, mute, volume down, volume up. Show/hide keyboard, home, special key. Not all of these work natively in android, but all functions can work with a little modification following that guide posted above. Â From memory, the keys that did work are as follows: the media keys, brightness and home. I personally configured the special key to be 'menu' and the show/hide keyboard key to be 'back'. The Expression comes with a built inÂ rechargeableÂ battery (non-removable) that charges over micro-usb (like your phone). Â It boastsÂ 300 hours!! battery life from a single charge and has an on/offÂ switchÂ so that you can ensure not to waste battery when not using it. 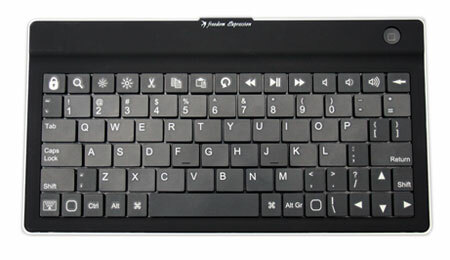 The Expression is priced at Â£39.95 at MobileFun -Â http://www.mobilefun.co.uk/freedom-expression-bluetooth-keyboard-p34065.htmÂ which is one of the cheapest bluetoothÂ keyboardsÂ availableÂ in their wide collection. This keyboard does exactly what it is designed to do, practical, the right size forÂ comfortableÂ use, great battery life, good quality, easy to pair and to use. My only negative, which is not really a negative of this product at all, is the way android handles hardware keyboards. Â If you know what your doing then you can get a full use of a product like this, but if you don't then you can be left with a lot of keys that don't function as expected, or at all.